No one can be without their cell phone these days! 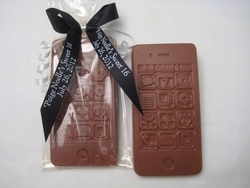 Imagine what your guests will say when they receive a CHOCOLATE CELL PHONE! Everyone love chocolate, and it seems everyone loves their cell phones. Makes a great Thank You gift! Your guests will go crazy for these delicious chocolate favors! Now they can have their phone, and eat it too! Our Chocolate Cell Phone is made of premium milk chocolate. It weighs a generous 2.3 oz. and measures 4.25” x 2.25”, now that's a big party favor! You can use these fun edible party favors as giveaways, as corporate party favors, birthday favors, Sweet 16 favors, or just to celebrate someone who can't be without their phone!